In Conway's Game of Life, a cell is in a state of either on or off, depending on the on-and-off state of the eight cells surrounding it. 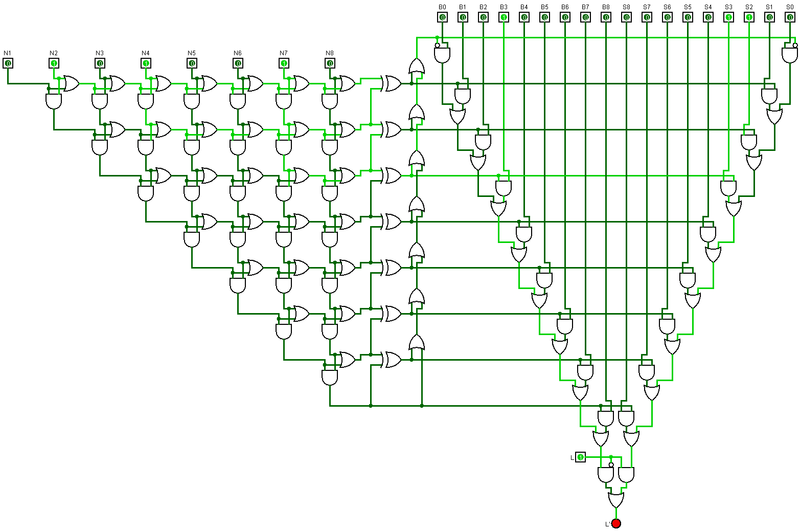 We can simulate this using a logic gate network with some sort of clock signal that updates every cell all at once. Your task in this problem is to build the logic gate network for a single cell that will update the new state of the cell given the state of its neighbours. if L is currently 0 and Bn is on where n is the number of N1, N2, ..., N8 that are currently set at 1, then L' is set to 1. Otherwise, it stays 0.
if L is currently 1 and Sn is off where n is the number of N1, N2, ..., N8 that are currently set at 1, then L' is set to 0. Otherwise, it stays 1. In the example of Conway's Game of Life, B3, S3, and S2 are on, while the rest of them are all off. Unlike my previous logic gate tasks, for this task you may use any two-input logic gates you want, not just NAND gates. This includes exotic gates such as if A then B, A or not B, or simply A, a gate that takes two inputs and always returns the first one (although I'm not sure why you'd want to use that one, you are allowed to). You are allowed unlimited constants, splits, and ground wires. The network to use the fewest logic gates to achieve this wins. I think the basic structure pretty much has to be a sum unit and a demultiplexer which uses the output of the sum unit and L to select the appropriate B_i or S_i. So there's one decision which is definitely interesting, and one dependent decision which may be interesting. The definitely interesting decision is the output format of the sum. The dependent decision is whether to structure the 18-value demux as two 9-value demuxes (switched by the sum) feeding into a 2-value demux (switched by L) or as 9 2-value demuxes feeding into a 9-value demux. I'm choosing to have the sum output in unary, so the 9-value demux is just 8 2-input demuxes in a chain, and the dependent decision is uninteresting. So for a total of 38 gates, the inputs N1 to N8 are transformed into 8 intermediate values T1 = MAX(N1, ..., N8) to T8 = MIN(N1, ..., N8). Effectively Ti is true iff at least i of the inputs are true. 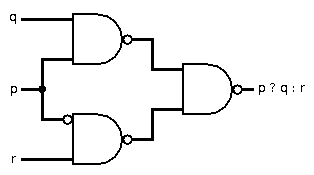 A 2-value demultiplexer can be done with 3 gates in many many ways. E.g. So two 9-value demuxes and a 2-value demux takes 17 demuxes; so does 9 2-value demuxes and a single 9-value demux. 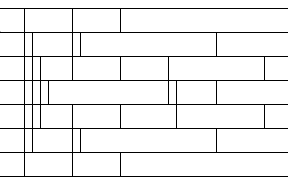 So the grand total gate count is 38 for the sorting network + 17*3 for the demuxes, giving 89. This uses a simple approach; first it counts the number of live neighbouring cells, and then checks if that number fulfills a birth/survival condition. Not the answer you're looking for? Browse other questions tagged atomic-code-golf logic-gates cellular-automata or ask your own question.